It is said that all good things must come to an end. The Maryelizabeth's edibleart Bakery no longer supplies food for the body. As promised, however, the Maryelizabeth's philosophy of LOVE, sharing and positive thinking has continued to develop further into a calorie-free adventure of exciting food for the spirit. What if all of life's gifts are already on your path just waiting to be discovered? "The Square of Life Affirmation Cards"
You are invited to preview a sample of the wonderful project which came to me quite unexpectedly one evening almost 15 years ago when the doors of the Fourth Dimension flew open right here in my studio. Life for me has never been the same since! I am now in the process of exploring my next step in the plan to reproduce and distribute the first edition of 500 copies of this 45 card deck of powerful affirmation cards. 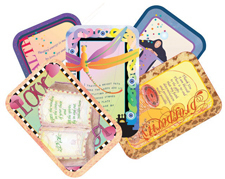 The Square of Life Affirmation Cards are indeed exciting tools for spiritual transformation. When I closed my beloved bakery I did so with the plan to live on an extremely modest income and rely on the power of affirmations to open the Doors of Abundance to take care of the rest. I have taken my decision very seriously as I set out to prove that everyone can tap into the miraculous flow of goodness and wonder which are gifts from The Universe. I am delighted to report that over these last three years I have enjoyed incredible eye popping experiences and more totally unexpected miracles than I could not ever have imagined when my work with this project began. I have become even more convinced, if that is possible, that the wonderful rewards of this project are real and available to everyone. Rest assured this project is big enough to fit everyone! I envision this first edition of 500 decks to be an excellent contribution as the world becomes a happier, more sane place "one affirmation at a time". Please note: Maryelizabeth's edibleart Gourmet Bakery has closed its doors as of September 1, 2014. I decided that I would leave the gourmet bakery section of the site intact, however, so that viewers can still enjoy browsing the many unforgettable bakery pages. I simply could not send almost 20 years of delicious LOVE into the ethers. They will always remain a part of me, and I hope a sweet memory of my many faithful and appreciative customers. These fun sweets fool the eye and delight the tastebuds with a hint of almond flavor. Their delicate beauty is perfect for fun get togethers. The Maryelizabeth's edibleart Philosophy: Let us tell you why we are so dedicated to bringing you unique, delicious "made from scratch" edible art. The Perfect Wedding Cake: Our downloadable Ebook "The Wedding Cake Buyer's Companion"
will guide you through the steps to finding just the right cake for your wedding celebration. Wedding Cake Gallery: Visit Maryelizabeth's edibleart Wedding Cake Gallery and see photos and descriptions of "made from scratch" wedding cakes. Baking Tips: Find out some helpful hints and secrets from the professionals that can improve your baking. Check out our Buffalo Cookies! Maryelizabeth's custom cookies are the perfect way to enhance a special presentation. See what we mean. This version of our unique buffalo cookies are a fun and delicious way to celebrate our patriotic holidays! The Finn's World Project was designed by pastry chef Elizabeth Bonerb and launched at the Gourmet Store of WNY several years ago as a unique and delicious way of making the world a happier place one bite at a time. Click on the above link to find out more information. Entry Page: Life without dessert! Home Page: There... that's better. The NEW site design features not one focus, but THREE. There is still a calorie free tour of the bakery and all of the beautiful and delicious products which made Maryelizabeth's edibleart famous for almost two decades. Elizabeth Bonerb's online artist portfolio is available as the second section of the newly revised edibleart site. metaphysical affirmation card deck which points the way to putting life's gifts to work beyond one's wildest dreams. Specials: We are very proud of our seasonal offerings. Print out one of our miniposters and hang it where everybody can enjoy a calorie-free feast for the eyes. View: Take a tour of all of the Maryelizabeth's edibleart products. Cakes: Visit our cakes, made with love and always from scratch. Pretty Cakes::See some breathtakingly beautiful creations designed by Maryelizabeth's edibleart. PrettyCakes Slide Show: See more of our prettiest creations. FunCakes: Maryelizabeth's fun cakes are always remembered as a focal point of the party. FunCakes Slide Show: See more fun cakes that brought smiles to everyone. Wedding Cakes: Click on each tiny image in the main gallery and enlarged cake images will appear. Each cake has its own story to tell! "The Wedding Cake Buyer's Companion"::Get valuable wedding cake tips. Download this Ebook today! Benefit from Elizabeth Bonerb's years of experience as a cake designer, pastry chef and graphic artist. She will walk you through each step in the selection process so that you will find the cake you have always dreamed about. Read Cake Stories and share some very special stories that are fun, romantic and unique. Cookies: Cookie for gifts, as wedding favors, big cookies in lunch boxes, and don't forget bar cookies, Italian cookies, custom cookies, cookies for your next promotion... Maryelizabeth's edibleart of Wellsville, New York makes them all! Big Cookies: See our delicious "made from scratch" big cookies and find out what flavors we make. Bar Cookies: We have taken bar cookies to a new level...just take a look! Italian Cookies: These very special cookies are the products of many hands over the years. We are proud to share them with you. Custom Cookies: These hand painted beauties have made us famous! OOOOH... Pick up a thrilling virtual gift at the end of the custom cookie display. Sweet Tables: These eyepopping arrangements are something we never tire of creating for our most discriminating customers. Besides we get to eat the broken cookies! Specialty Creations: The items in this section of our site cover a wide range from vegetarian entrees to food as art presentations. to quote a friend..."tasty, tasty, tasty!" Vegetarian Slide Show: See more veggie glamour and taste! Food As Art: Examples of edible art that have put us on the map! Artfood Slide Show: Feast your eyes! About Maryelizabeth's edibleart: a premiere gourmet bakery in Western New York State. 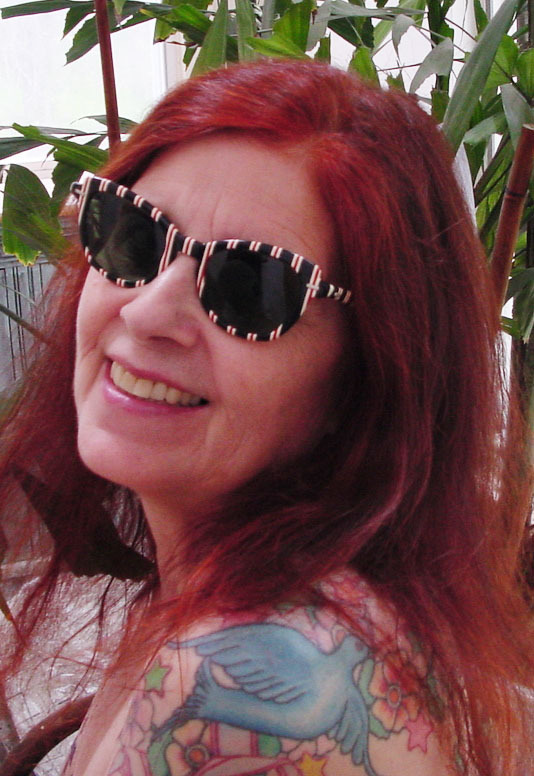 About Elizabeth Bonerb: tthe owner of Maryelizabeth's edibleart and the designer of this site. Awards: We've won stuff ! Privacy: You are safe with us. Copyright Information: Find out more about the images and words used to create this web site.